This article is the beginning of an extended multipart review of the New American Bible, Revised Edition (2010) — NABRE. The Old Testament has been revised extensively. The New Testament remains that of the 1986 prior revision. The Psalter, previously revised in 1991, was revised anew for this edition. The printing of the NABRE that I am reviewing is the Saint Benedict Press edition, termed ‘Quality Paperbound’ by the publisher. The cover depicts the Blessed Virgin Mary, the Apostles and other disciples gathered at the time of Pentecost. The Holy Spirit is depicted descending in a bright light in the form of a dove. This image is from a painting, Pentecost, by Titiano Vecellio (c. 1488 – 1576). The early pages of the book list the persons involved in each translation, the editors, translators, and other persons, for each respective edition, from 1970 to 1986, 1991, and 2010. This practice is in accord with the decision of the Council of Trent, requiring editions of the Bible to name the editor, translator, and publisher. It is a requirement often ignored, and so it is good to see that St. Benedict Press included this information. I was astounded to find that this edition, immediately after the table of contents, begins with a very long quote from a “Lord Thomas Babington Macaulay”. First, the use of the British parliamentary title “Lord, “with a capital “L,” at the very start of an edition of the Bible, in which Lord is subsequently used solely to refer to God, is very offensive. It displays at best a callousness toward the devotional use of the Bible, and at worst a contempt for piety. He name could easily have been cited, without any disrespect to him, without his title. The term “Lord Macaulay” is then repeated later on the same page. That Macaulay should be quoted at all in the introduction to a Catholic Bible is very disturbing. He was an Anglican, not a Catholic. He was not prominent in the Anglican Church. He was primarily a politician, not a philosopher or theologian. Macaulay was Secretary at War and Paymaster-General in England. He also served the British government in India under British colonialism. The quote itself puts the icing on this cake. It is a description of the Catholic Church, observed from the outside, and treated as merely one of many ‘Christians sects’. Macaulay describes the Catholic Church as if he were a secular historian, and as if the Church were a mere human institution. In fact, he begins by calling the Catholic Church “a work of human policy.” The quote ends with an odd reference to the time “when idols were still worshipped in the temple of Mecca” [pre-Islamic times]. The passage consumes more than one full column of the two-column page titled ‘The Succession of Popes’. Whoever wrote that page (it is unsigned) found it “interesting to note that Lord Macaulay was no friend of the Papacy or of the Roman Catholic Church.” If so, then why does his quote begin a Roman Catholic Bible, and why is his point of view on the Church the main focus of a two page article, whose second page is nothing but a list of Popes? But I can understand why the author of this offensive article did not want his name on it. He would have been severely criticized. 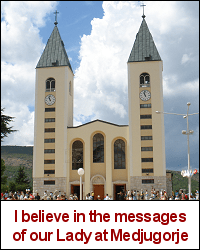 By placing this article at the start of a popular Catholic Bible, he was able to slap every devout Catholic reader in the face while hiding behind anonymity. The font for the Biblical text is a serif typeface, apparently in 9 pt font size. This typeface is relatively easy to read, despite its size. The lower case letters are larger than some other fonts of the same size, and the closed loops in letters like ‘a’ and ‘e’ are larger than in some other fonts. The typeface for the annotations and cross-references is apparently 7 pt font size, but using the same readable typeface. The book as a whole has many annotations. There are also extensive cross-references to other passages of the Bible. Personally, I prefer a text with fewer annotations, rather than more. Cross references are occasionally useful when studying the Bible, and rarely useful, in my opinion, when reading for personal devotion. The annotations are indicated by various symbols; the cross-references are indicated by lowercase letters. I find that these symbols and letters distract from the reading of the text, especially on pages where they are numerous, and most especially in the Psalms. The annotations in the New Testament appear to be the same as in the 1986 edition, so that both the translation of the New Testament and its notes are unchanged. The Old Testament annotations are scholarly and historical, but not devout or doctrinal. 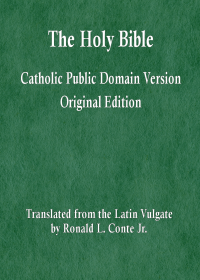 For examples of annotations that relate Bible passages to doctrines of the Catholic Faith, and assist in the use of Scripture for devotion, see the original Douai Rheims Bible, or the Haydock Bible. Unfortunately, most modern editions of the Bible have annotations that are written from a merely scholarly point of view, at times even speaking as if the annotator were not a Christian believer. This approach of scholarship without faith is common practice today among Catholic and Protestant Biblical scholars. The introduction to Genesis suffers from this same problem of scholarship without faith. There is a long passage explaining that the creation-flood story did not really happen, but is merely a narrative adapted from pagan mythology in order to answer various philosophical and theological questions. More on this topic in future posts, hopefully.